FAQ Pipe Cold Cutting Machine - You have the question? What is pipe cold cutting? Pipe cold cutting is a process to cut pipes without heating up the pipe material. Where high temperature or big heat are not desirable, Pipe Cold Cutting machines are used. Especially at offshore, high pressure boilers and pipeline construction this cutting methode is very popular. How to use a pipe cold cutting machine? A cold cutting machine is a rotating machine which is clamped on the outer pipe diameter. 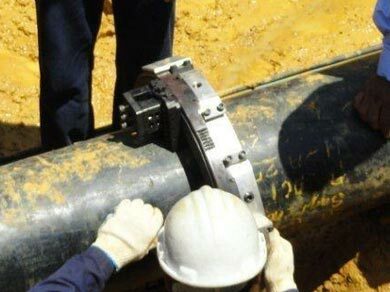 A rotating ring with tool holder and cutting tool is turning around the pipe and cutting the pipe.